Challenging the notion that fashion and furniture were or are separate enterprises and distinct material aesthetic traditions, this collection focuses on three material and conceptual links central to understanding the relationship between interior design and fashion-the body, fabric, and space. The volume considers the changing visual, material and spatial character, methodological challenges posed by, and formal, political and historiographical significance of, a wide range of British, European and North American case studies since the eighteenth century. The volume's eleven case studies allow the reader to understand connecting notions behind the formation of interiors and fashionable clothing. The essays combine a wide range of significant and challenging new examples alongside powerful reversionary analyses of the various periods, artists, designers, and their best and significant objects. 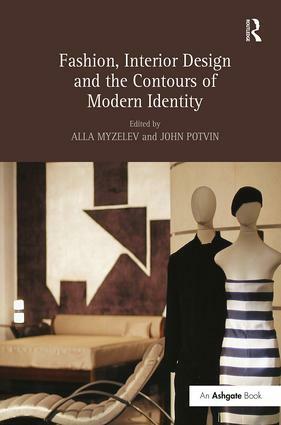 Fashion, Interior Design and the Contours of Modern Identity is concerned not only with fabric, but also with the body and the implications of embodiment in the practices of both design domains which are equally invested in the comfort, aesthetic pleasure, extension and support of the body in different and yet seemingly identical ways. Contents: The velvet masquerade: fashion, interior design and the furnished body, John Potvin; Crafting queer spaces: privacy and posturing, Peter McNeil; 'She weaves by night and day, a magic web with colours gay': trapped in the gesamtkunstwerk or the dangers of unifying dress and interiors, Anne Anderson; Structure, cladding and detail: the role of textiles in the associations between identity, the interior and dress, 1860-1920, Clive Edwards; Translating textiles: 'private palaces' and the Celtic fringe, 1890-1910, Janice Helland; Decadent decors and torturous textiles: fatal fashions and interior design in the fin-de-siècle novels of Rachilde, Heidi Brevik-Zender; Chinese robes in western interiors: transitionality and transformation, Sarah Cheang; Modernism, orientalism, craft: French couture and the early furniture of Eileen Gray, Joseph McBrinn; Furnish the land of my dreams: life and theatre of Louise and Frederick Coates, Alla Myzelev; Designing sapphic modernity: fashioning spaces and subjects, Jasmine Rault; Framing the modern woman: Elsie de Wolfe, from clothes horse to interior decorator, Penney Sparke; Cross-dressing fashion and furniture: Giorgio Armani, orientalism and nostalgia, John Potvin; Index. Alla Myzelev is an Assistant Professor of Art History at the University of Guelph, Canada. She has published on the relationship between Russian and Ukrainian avant-garde and craft, the role of women in the Arts and Crafts Movement as well as the representation of material culture in museums and private collections. John Potvin is Associate Professor of European Art and Design History at the University of Guelph, Canada. He is the author of Material and Visual Cultures Beyond Male Bonding, 1880-1914: Bodies, Boundaries and Intimacy (2008) and editor of The Places and Spaces of Fashion, 1800-2007 (2009).